Explore the Eastern Cape on this active adventure to South Africa. Watch huge herds of elephant marching between waterholes and look for the rest of the Big Five in Addo Elephant Park. Discover waterfalls, huge indigenous forest and various peaks of the Amathole Mountain Range whilst walking on ancient trails around Hogsback. Paddle up the Kariega River in a kayak and stay the night in a riverside bush camp. Spend a morning mountain-biking in a valley and walk in the largest dune field in the southern hemisphere. The trip starts today in Port Elizabeth, we will meet our Explore leader and fellow group members at the airport and then drive for an hour to reach Addo Elephant Park. Originally created to protect a single herd of endangered elephant, Addo is now one of the largest nature reserves in Southern Africa and the only one that claims to have the Big Seven! Along with the park's population of lion, elephant, rhino, leopard and buffalo; the Sundays river area, which is found within Addo's boundary has great white shark and southern right whale to complete its complement of the Big Seven. After checking into our forest cabin we will head out on safari in a converted minibus, which has modified windows to ensure good visibility for game viewing. We are up early this morning to get out on safari whilst it is still cool and the animals are at their most active before the heat of the day sets in. We will be in open sided safari jeeps for the full day with a ranger from the park. Addo has a varied landscape featuring forested woodland and large open spaces of grassland; the forest areas are visually attractive but the grassland ensures great wildlife viewing. We will hope to see lion lounging in the open spaces and there is a good chance of seeing herds of elephant marching between waterholes, led by their matriarch. For animal lovers looking to spot the more unusual beasts, Addo has the largest population of flightless dung beetle in the world and rarer antelope such as eland and kudu. We will stay just outside of the park this evening in a small lodge. After breakfast we drive northeast and make our way into the Amathole Mountain Range, as the road starts to climb we are surrounded by huge ancient forests and several peaks and escarpments loom in the distance. Our destination is Hogsback, a small town popular with artists, walkers, nature lovers and those wanting to escape South Africa's busy cities. The town has a feel of a quaint English village and we will spend two days here. We will check in and there is some free time to buy some lunch in one of the many cafes in town before taking a guided walk. We start off with the Bluff Walk, an easy walk through a large grass field which offers incredible views over the verdant Tyume Valley in the distance; whilst we walk we are constantly shadowed by the 'three hogs', part of the Amathole range and the reason for the name of the town. This walk will take us around 45 minutes as is on flat ground. After the Bluff Walk we will take the Military Path, a short walk into the indigenous forest that was used by British soldiers in colonial times. This walk should only take 40 - 50 minutes but does contain some inclines and uneven/ rocky paths. We will then return to our lodge and there will be some free time to either take a self-guided walking trail or to explore the local labyrinth, which is a nearly a mile long and intricately designed. This morning we plan to stretch our legs with a walk through beautiful forests to several waterfalls. The Madonna and Child Falls is reached via a moderately steep downhill walk, via the Big Tree (an 800-year old Yellow wood). The route takes you through the indigenous Tyumie Forest and includes the Swallow Tail Falls and the Bridal Veil Falls. With a little bit of imagination, an outcrop of rock on the face of the falls helps to form the shape of the "Mother and Child" - hence the name of the falls. The walk will take approximate 4 hours and we will take plenty of time to enjoy the surroundings as we go. There are various walks around the area and it is not unknown for trails to be closed at short notice by the Forestry Department. If this happens we will take an alternative walk. The afternoon is left free for you to relax in the small, quaint town or there is the chance to follow some shorter walking routes. This evening there will be the option to visit the Edge Mountain Retreat, with your leader, where we can walk 1.4km of enchanting paths around the Labrynth on the Edge. One of the largest labrynths in the world, its sits perched on the edge above the valley below and is a wonderful spot to enjoy a sundowner whilst watching an epic sunset. After a leisurely start we leave the mountains behind and make our way to Kenton-on-Sea, a small town on the Indian Ocean sitting on a strip of land between two rivers - Bushmans and the Kariega. We will check in to our hotel before meeting a local guide from the Ekuphumleni Township who will take us on a walking tour of his area. Ekuphumleni is a district of Kenton-on-Sea which has suffered from immense poverty and the residents have not had the same opportunities as other people in the Kenton area; however there are now some local entrepreneurs who are championing their township. Our guide will walk us around the area, we will meet local people, step inside a shebeen - local pub and meet a Songoma - a traditional witch doctor. This tour is all about empowering local people and understanding more about how many South Africans are living their lives today. We'll then make our way to Woodlands, our home for the next three nights. This unusual accommodation is a small, family run property with a huge welcome set high up on the banks of the Bushman's River. Our cabins are scattered along the pathways within large gardens, with hammock 'chill-out' zones, The Goat Shed Bistro, an English style pub and indigenous flora making it a great spot for bird spotting. It's a real escape from reality and somewhere you can enjoy feeling part of the family, including their resident cats and dogs! We leave our hotel this morning and walk for 6km to the mouth of the Kariega, the terrain is mostly flat but we will take a gentle pace around the town and expect the walk to take around two hours. When we reach the Kariega we will start our kayaking trip up river. There will be two people per kayak and we will paddle upstream for approximately two hours, at first we are surrounded by farmland but that quickly changes as the river meanders through green forested hills. It is unlikely we will see much game from the kayaks but we will certainly see a vast array of birds including African fish eagle and the vivid sunbird. Our destination is a bush camp on the banks of the river, where we'll enjoy lunch. Here we'll enjoy a short walk in the bush around a private game reserve. Walking in the bush is one of the best ways to start to understand the local environment, hearing the sounds of birds and smelling the different plants as we slowly and quietly keep a look out for giraffe, wildebeest, springbok and impala. After this we'll return to our kayaks and paddle our way back to the river mouth, where we'll be transferred back to Woodlands in time for a hearty dinner. After a good breakfast at the Bush camp, we drive back to Kenton-on-Sea and leave for a 2 to 3 hour Mountain Bike ride. This is through the Bushmans River Valley and onto farm roads with off road tracks through the indigenous veld. This is not a technical ride and the only requirement is the ability to ride a bike, previous mountain biking experience is not necessary. The trip starts with a 5km downhill section and then on to 1km of gravel track before 10km of flat road along the Bushman River. The end of the ride is back up the river valley with a 5km uphill section. For those not fancying the incline it is possible to trailer your bikes with the support vehicle and hitch a ride back to the hotel. We have a picnic lunch today and then drive out to the Woody Cape Reserve for a walk on the Alexandria Dune Fields. This area is the largest coastal dune field in the southern hemisphere and we will take a 7km walk known as the Dassie Day trail. This walk will take us from coastal paths with spectacular views over Bird Island in the Indian Ocean to a huge indigenous forest found within Addo Elephant Park. It should take around 3 hours as we set a slow pace and have some inclines due to the sand dunes found here. After the walk we return to Woodlands and there will be a braai this evening at the hotel, which will be at your own expense. 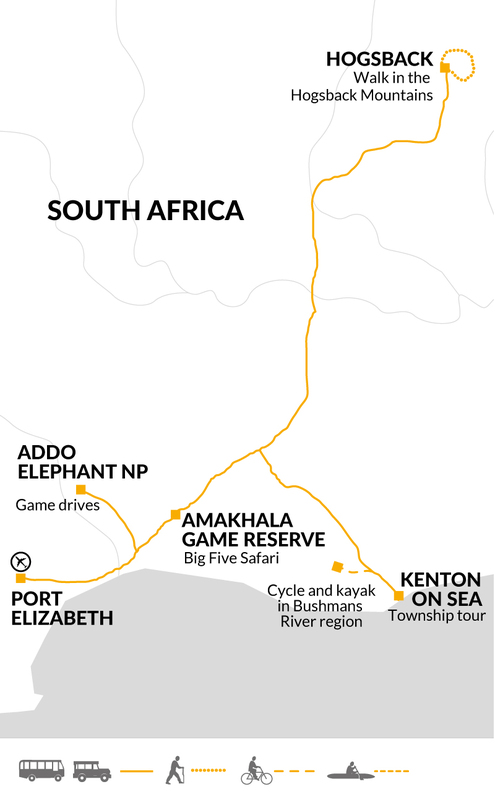 Late this morning, after breakfast, we'll depart for Amakala Game Reserve, home to the Big Five and our final stop on this Eastern Cape adventure. On route we'll break up the journey with a stop at Oakly Farm Stall, a traditional style padstal, known for great coffee and pies. On arrival we'll check in to our accommodation. Inside the game reserve we'll be staying in a small family run camp, where the tents are fixed into the hillside offering views across the floodplains below. Each tent has a private terrace where you can enjoy the sounds of the surrounding wilderness and maybe even glimpse the game in the plains below. Free time in between game drives can be enjoyed by the pool or with a coffee on the communal deck which offers fantastic views. Later this afternoon, we'll get aboard the open sided game vehicles and head out into the reserve in search of the Big Five. After breakfast today we will explore Amakhala Game Reserve again during our second game drive. The Amakhala Reserve is a huge conservation programme which was once a network of various farms that have now been returned to their natural bushveld and the area has been repopulated with wildlife indigenous to the region. Home to the Big Five, there are over 60 mammal species within the reserve, including elephant, lion, cheetah. After lunch at the camp, we will have a conservation talk with the specialists at the Chipembere Rhino Foundation, an organisation that has been fighting rhino poaching in the area as well as working on numerous conservation projects within the reserve. We will learn about the work they are doing on the ground and hear some inspiring stories about saving magnificent species. Later this afternoon, we'll return to our open sided vehicles for our last two hour game drive before returning to the camp and enjoying a drink around the fire under a starlit sky. Our trip ends after breakfast this morning when we'll all leave together for Port Elizabeth. To allow some flexibility with departure flights, there will be two drop-off times at the airport; 11am and 1.30pm. For those on an earlier flight you will be dropped off at the airport for check-in at 11am and for those with a late afternoon flight there will be a chance to catch a few last sunrays and have lunch in Port Elizabeth before ending at the airport at 1.30pm. Walking boots, trainers or sandals for relaxing/travelling in. Take a tough soft bag or holdall (or rucksack with detachable frame) suitable to be carried by 4WD vehicle. Total allowance: 44lb/ 20kg maximum (due to weight restrictions on our vehicle). Also take a daypack for items needed during any activities and game drives (20-30 litre). Take a torch, sunhatunscreen and insect repellent. Mosquito nets are not required as the accommodation provides screening where necessary. Although entirely voluntary, tipping is a recognized part of life in this region of the world. Some local staff will look to members of the group for personal recognition of particular services provided. You should allow £25 for tipping. In order to make things easier for you, the Tour Leaders may organise a group's tips kitty and if this is the case, they will account for it throughout the tour. During this trip we will stay in a variety of accommodation including safari lodges, cabins, homesteads and simple cottages. Accommodation is often small, family run and may feature shared bathroom facilities. More than just B&Bs; individually styled and tastefully furnished and often lovely gardens and a pool. The properties we use give a real taste of traditional South African hospitality and we love supporting these small local businesses. Why not extend your holiday with an extension to the thundering Victoria Falls in Zimbabwe. Click here for details. This trip features the natural highlights of the lesser-visited Eastern Cape area and offers plenty of opportunity for activity and wildlife spotting.